Stamp with Kathya: More Sunday Stamps Gold! Hello Stampers! Happy Sunday. Hope your day is going well. I'll be watching TV later tonight as the season finale of Breaking Bad is tonight!! But I made some time to stamp earlier today. 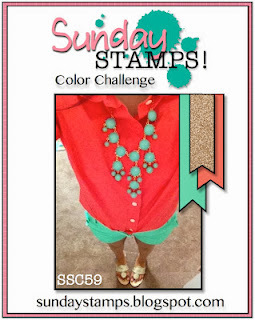 Our current Sunday Stamps color challenge continues to inspire me and I'm back today with a little more inspiration. There is still time for you to join us, you have until this Friday, October 4th, 6 pm EST to play along. Thanks to all of you who have played along, great cards ladies! I made 3x3 cards using the Magical Masking Tape technique from Splitcoast Stampers using Calypso Coral and Pistachio Pudding. The tutorial states to use glossy card stock but I used Whisper White and it worked fine for me. I had so much fun with this technique and I also used our Gold Embossing Powder. I kept the cards simple to highlight the technique and the butterflies. I know I'll be using this technique again. 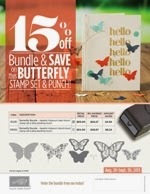 Tomorrow is also the last day to take advantage of the bundle to save 15% when purchasing the Papillon Stamp Set with the Bitty Butterfly Punch. Remember you can shop my online store anytime. Click here to purchase this great bundle. Thanks so much for stopping by today. Until next time friends!